Outside of waiting for Justice League next year, The CW may be getting ready to unleash the best superhero crossover event any comic book fans are likely to see for a long time. The event, titled Heroes v Aliens, will kick off on Supergirl and span four nights. Now the network has released a new trailer for the event, giving an excellent look at all of the superhero action fans can look forward to. The network recently uploaded the new trailer to their YouTube channel, and it is absolutely packed with every hero from the Arrowverse. Supergirl, The Flash, Arrow and Legends of Tomorrow are all set to cross paths in this mega event, which when strung together will be longer than the extended cut of Batman V. Superman: Dawn of Justice. But, with proper pacing and depending on how you watch it, Heroes v Aliens may not feel that way. Here is how the first crossover episode, which is Monday's episode of Supergirl, "Medusa" is described. "Eliza (guest star Helen Slater) comes to town to celebrate Thanksgiving with her daughters. Alex (Chyler Leigh) decides it's time to come out to her mother; Kara (Melisa Benoist) is shocked when Eliza suggests Mon-El (Chris Wood) has feelings for her, and Winn (Jeremy Jordan) and James (Mehcad Brooks) consider telling Kara the truth about the Guardian. Meanwhile, CADMUS unleashes a virus that instantly kills any alien in the vicinity so Kara enlists an unexpected ally - Lena Luthor (Katie McGrath). 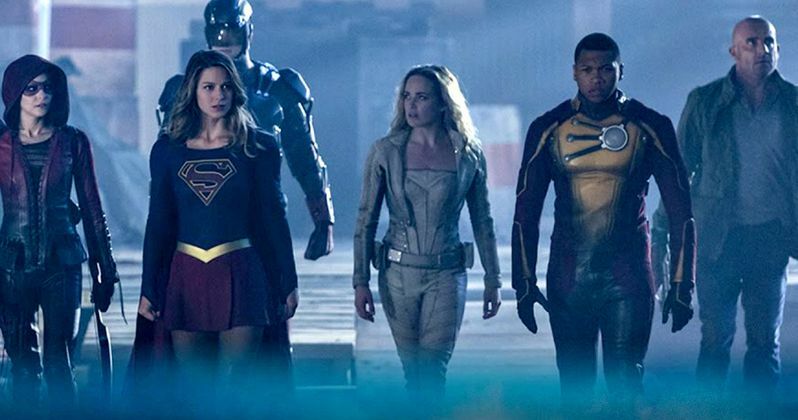 The epic superhero crossover kicks off tonight when Barry Allen (guest star Grant Gustin) and Cisco Ramon (guest star Carlos Valdes) seek Kara's help with an alien invasion on their Earth." The trailer itself is pretty much an action-packed glory shot, showcasing hero after hero and action scene after action scene. It appears as though Barry Allen is going to be the one responsible for assembling this mostly B-lister superhero squad in order to stop the aliens from taking over the planet. We are also going to be seeing some anticipated returns of certain guest stars, such as Manu Bennett as Deathstroke. It certainly appears that The CW is making the absolute best of having all of these DC Comics characters at their disposal. The movie side of the DC Comics universe has had its fair share of problems so far, but many fans have thoroughly enjoyed what is going on over on The CW with the Arrowverse, at is commonly called since Arrow was the first show to kick things off. It certainly carries a generally lighter tone, but as we have seen, dark doesn't always mean better. Hopefully, given the relatively limited budgets on TV when compared to blockbuster movies, this whole crossover event won't look like it was made on the cheap. So far, from what we can see in the trailer, it looks pretty good. The four-night Heroes v Aliens crossover event kicks off with Supergirl on Monday, followed by The Flash on Tuesday, Arrow on Wednesday and finishing with Legends of Tomorrow on Thursday, December 1. Save for Supergirl's more famous cousin Superman, virtually every superhero from the Arrowverse will be featured in this event, so be sure to tune in. Assuming you're a fan of any of these shows. You can check out the new trailer for the Heroes v Aliens crossover event for yourself below.